Terms and Use Agreement to become a vendor on the Vacations and Weddings in Maine web site. This is a vacations and weddings directory web site only; it is not and does not contain a recommendation, warranty, guaranty, inducement or endorsement of any kind. Representations herein were supplied by the individual businesses and organizations. The publisher, Vacations & Weddings in Maine, does not assume any responsibility for truth, falsity or completeness of any representation made herein or any errors, changes, services rendered, or changes made in the use of this directory. This information was compiled as accurately as possible. Services are frequently subject to change. Errors called to the publisher's attention will be corrected. All rights reserved. No part of this publication may be reproduced, stored or transmitted in any form or by any means, without permission in writing from the publisher. 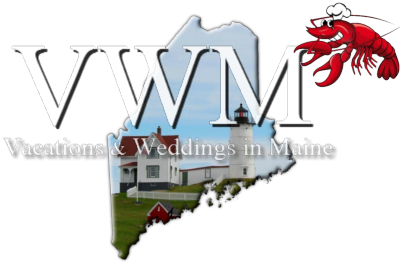 Vacations & Weddings in Maine is a web site promoting Maine and Maine businesses. While we strive to assure that the information on the web site is accurate and current, we do not and cannot warrant the accuracy, reliability or timeliness of any information on this web site and shall not be held liable for any losses caused by reliance on the accuracy, reliability or timeliness of such information. Vacations & Weddings in Maine reserves the right to deny any and all requests, to any business wanting to become a vendor on the Vacations & Weddings in Maine web site. If content is found not to be approved by the company, Vacations & Weddings in Maine, we have the right to remove existing listings, landing pages, existing links at anytime without notice.